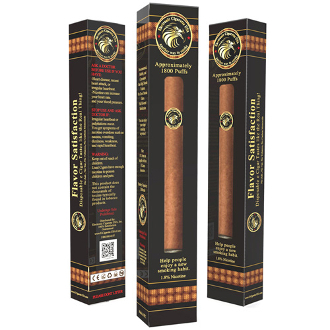 Disposable Electronic Cigars Classic Cigar Flavor is full bodied and bold with rich, smooth undertones. It has an all-around great flavor and it has a clean aftertaste just like the real thing. It's tried and true. When other flavors get complicated, our Classic Cigar flavor keeps it simple. Our 80/20 PG/VG e-liquid gives you the perfect blend of flavor and rich vapor. Pair that with our top notch Disposable Electronic Cigars and you are ready to roll. Our disposable electronic cigars will give you clouds of flavorful vapor and the look and feel of a real cigar. The wrapping has the look of a hand rolled leaf. The realistic ash at the end glows orange for a genuine look as you vape and the soft tip allows you to chew your disposable cigar just as you might a real one. Disposable electronic cigars are available in a 11mg,18mg and 24mg nicotine strengths and will last 1,000-1,800 puffs. Length of life with these awesome cigars depends on the vaper. A heavier vaper who inhales deeper may get fewer puffs than a light to moderate vaper would so keep this in mind when placing your order. These cigars come ready to use and will work until the battery runs down.